The last seven days have been packed with news items from Manchester, so I won't waste any time with preliminaries. On Tuesday came a report that local independent bus companies were being warned to "clean up their act". There have been complaints about low standards of services and the withdrawal of routes. Manchester Piccadilly (above) has lots of independent bus services with many-coloured liveries, such as Finglands (41 to Altrincham, above) Stevensons' (130 to Macclesfield), and many others including Bee Line, Wall's, Bullocks, Mayne, UK North, Bluebird, and the all-pervasive national giant Stagecoach. The presence of a number of independent operators at Piccadilly tends to obscure the fact that Stagecoach has the lion's share of the services, not only in Manchester but all over the country. Speaking from daily experience, Stagecoach operations seem to project the most professional image, and they have the newest buses, but also the highest fares. A journey costing 80p on a Stagecoach 42 will only cost you 50p on the same route operated by Finglands. You can of course buy a Stagecoach "Megarider", entitling you to a week's unrestricted travel on most Stagecoach Manchester services, but as of today, it will cost you £6 instead of £5. As the "bus wars" continue, news came on Tuesday that the Metrolink extension through east Manchester to Ashton will not be ready for the 2002 Commonwealth Games. As reported previously in the Newsletter, the route to Eccles has already been approved, and a branch along the old railway line to Chorlton and Didsbury will also be added to the network in due course. Speaking of railway lines, driving past the train sheds at Longsight today I noticed the words "Le Eurostar habite ici" written in large letters. So it won't be long before passengers at Gare du Nord, Paris, and Bruxelles Midi, will be hearing the words "Le train à destination de Manchester Piccadilly..."
On Wednesday, there was confrontation on the small piece of Woodland known as Bluebell Wood, situated in the conservation area of Victoria Park, not Longsight as is still erroneously being reported in the media. Manchester University are to build a new hall of residence on the site. Full of confidence after widespread coverage of the Manchester Airport protest, tree people had taken up residence to try and prevent the wood from being cut down. When workmen moved in to evict them, ten people were injured. One protester threw himself under a lorry. Another, named "Hobbit", described the action as "the breakup of a community". Tony Bowyer of the Victoria Park Residents Association also expressed his opposition to the plan, saying that local residents hadn't been taken into account. Whatever about the arguments and counter arguments, the contractors wasted no time in getting on with their job. By the end of the week, most of the trees had been chopped down, and the site was surrounded by a wire fence, with three security guards on 24 hour duty. It seems lessons have been learnt on all sides. This wasn't the only defeat suffered by environmental protesters this week: An appeal by Runway 2 opponents Philip Benn and Philip Johnson was thrown out by a judge at a hearing in Manchester on Friday. Meanwhile work proceeds on Manchester's eastern motorway. Passing the M66 roundabout at Audenshaw today, I saw diggers starting to level the earth in readiness for the laying of tarmac. The £120m motorway should be ready in 1999. While new buildings spring up all around the city, a unique old ruin in Gorton has been singled out as being on a par with the Taj Mahal in India, and the Santa Sopha Mosque in Istanbul. Gorton Monastery was built in 1872 and abandoned in 1989. For a few years it became decayed and vandalised. A group was formed to try to restore the building. Then a representative of the World Monuments Watch Fund, based in New York, visited the place and it was decided to include it in the Fund's Top 100 endangered sites. The Arndale Centre was in the Manchester Evening News headline today - it appears that P&O, owners of the development, are planning to sell it to Capital Shopping Centres, owners of the Gateshead Metro Centre. The sale of the Arndale Centre, whose freehold is owned by the Council, may have a key effect on the city centre redevelopment, work on which is continuing at a steady pace. 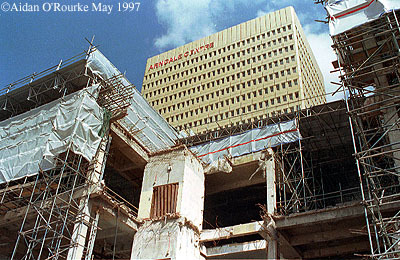 The ugly yellow tiles, famous for making the Arndale look like "Europe's biggest public toilet" still cover a large area of the exterior, but when the last one is removed, there is likely to be a celebration! And who knows, perhaps it may be renamed the "Diana, Princess of Wales Centre". Meanwhile, on the day the political representatives of the Irish Republican movement commence negotiations in Northern Ireland, victims of their terrorist wing, who planted last year's bomb in the centre of Manchester, appeared on television. Many traders, whose livelihoods were destroyed by the IRA's attack, still haven't received any compensation from the government. They were appearing on a new live BBC TV programme, "Here and Now", broadcast from Manchester, and presented by Juliet Morris. Manchester has always been a centre for great entertainment, whether music, comedy, variety or the theatre. As for film or TV drama, it perhaps hasn't been used as a backdrop as often as it might, despite being a major city with lots of real-life drama. This looks set to change, however, with the filming of a new police show in Manchester. "City Central" is a 10 part peak-time BBC series written by Eastenders scriptwriter Tony Jordan, which is to be broadcast in the Autumn. The location isn't named in the show, but familiar scenes will appear on screen, just like in Prime Suspect 5, "Errors of Judgement", which was awarded a US Emmy in Pasadena yesterday. Another series shot in Manchester, "Cracker" starring Robbie Coltrane, has provoked great interest in Manchester and Manchester University. It seems that thousands of young people who have watched the show would now like to study Criminal Psychology, and have been writing to the University for details of the course. Unfortunately the course isn't offered by the University. Students studying on the thousands of courses offered at the four universities in and around Manchester have been returning in large numbers for the autumn term. The city's many pubs, clubs, cafe's, continental style bistros, and oriental style bars, including Yoyo's Noodle Bar (above right), situated on the corner of Wilmslow Road and Wilbraham Road, are ready for them. The temperatures have become noticeably chilly during the past few days, though we had what felt like an Indian summer in the earlier part of the week. Rain has alternated with sunshine and clouds, blown along by strong winds. Today was mostly overcast though with brighter skies far in the west towards the end of the day. Temperatures are in the high teens celsius, around 60 degrees fahrenheit. Prince Philip will be on an official visit to Greater Manchester this Friday, and you can be assured that your "Eyewitness in Manchester" will be there to try and get a photo and perhaps even have a word with him. The Prince will be visiting the Salvation Army hostel on Grosvenor Street, Chorlton-on-Medlock. Some major developments to Eyewitness in Manchester are coming during the next few weeks. The site will be given a new look, and new features will be added, including a guide to districts in Manchester, as well as a "Who's Who" of people with Manchester connections. As for the 1947 report, I have received interest in the feature from an unexpected corner. Many thanks to those who have contacted me expressing their support for the column, which is again absent from this week's update. More news next Monday.